A nearly perfect month of February did not end the way the Quinnipiac men’s basketball team hoped it would. The Bobcats had their seven-game winning streak snapped Thursday night at TD Bank Sports Center. Siena’s Rob Poole poured in a three-point play with 35 seconds left in regulation to give the Saints a 72-70 victory over Quinnipiac. The loss closes a month where Quinnipiac went 7-1 but kills the Bobcats chances of earning a share of the Metro Atlantic Athletic Conference title. Instead, it now gives Iona the regular-season championship. Quinnipiac concludes its regular season on Sunday at Marist. Tip-off is slated for 2 p.m. at McCann Field House in Poughkeepsie, N.Y. The Bobcats are still in control of the No. 2 seed in the MAAC conference tournament which starts next week. Ike Azotam led Quinnipiac (19-9, 14-6 MAAC) with 15 points and 10 rebounds for his 43rd career double-double. Ousmane Drame scored 12 points to go along with 10 rebounds but played just 18 minutes due to foul trouble. Despite the foul issues, Drame recorded his 13th double-double of the season. Drame ended up fouling out with 34 seconds left. 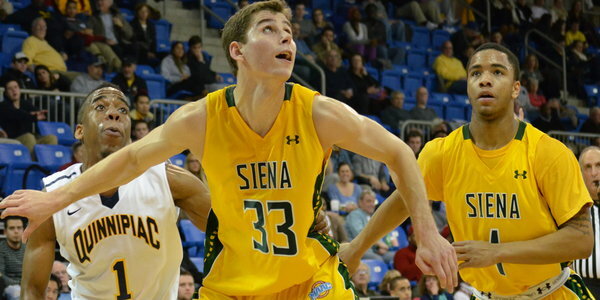 Brett Bisping led Siena (14-16, 10-9 MAAC) with 16 points and 10 rebounds, which earned its third straight win. Poole and Lavon Long both scored 13 while Ryan Oliver netted 11. Zaid Hearst struggled for Quinnipiac on 4-of-16 shooting but added 12 points, all in the second half. Hearst hit what looked like a key 3-pointer from the left wing with 51 seconds left to give Quinnipiac a 69-66 lead. On the next possession, Long drew a foul on Drame ending his night with his fifth foul on a drive to the basket with 35 seconds left. Long made the first and missed the second, but Poole boxed out Hearst to corral the rebound, made the put-back, and completed a three-point play to give Siena a 70-69 lead with 33 seconds remaining. Quinnipiac had an opportunity to regain the lead with less than 10 seconds left in regulation, but James Ford Jr. airballed a 3-pointer with seven seconds left to play. Following Long’s two free throws, Quinnipiac had possession with a chance to tie, but Justin Harris bobbled an inbounds pass for a potential game-tying 3-pointer. Harris was then fouled and made one of two shots to eventually end the game. The Bobcats outrebounded Siena 45-37 but committed more turnovers and missed more free throws. Quinnipiac had 16 turnovers compared to Siena’s eight. The Saints also made 19-of-21 free throws, while the Bobcats went 15-of-22 from the line. “We made too many mistakes,” Moore said. The Saints overcame a 10-point, first-half deficit thanks to a 7-0 run to close out the half. Quinnipiac led 34-33 at halftime. Harris added 11 points and five rebounds off the bench. Evan Conti scored 10 points, including two 3-pointers in the first half. Quinnipiac’s Umar Shannon missed nearly all the second half after he was helped off the court after the first media timeout. Shannon played 24 minutes, and appeared to fall after a few players collided down on the court in the paint.